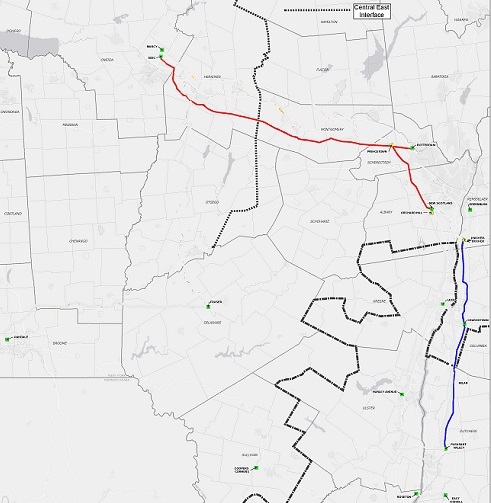 The Public Service Commission initiated the AC Transmission proceedings to consider whether to address the persistent transmission congestion that exists at the Central East and Upstate New York/Southeast New York (UPNY/SENY) electrical interfaces. The Commission sought proposals from transmission owners and other developers proposing projects to increase the UPNY/SENY transfer capacity by approximately 1,000 megawatts. After an initial round of proposals was received that raised environmental siting concerns, the Commission called for revised proposals that would better utilize existing rights-of-way and better match the scale of proposed powerline structures to be in keeping with existing facilities already in the landscape. Twenty one proposals were received from four entities: North America Transmission Corporation (NAT), the New York Transmission Owners (NYTOs), NextEra Energy Transmission New York, Inc. (NextEra), and Boundless Energy NE, LLC (Boundless). The Commission then directed the Staff of the Department of Public Service (DPS), with the assistance of the New York Independent System Operator (NYISO), to undertake a comparative evaluation of the project proposals. 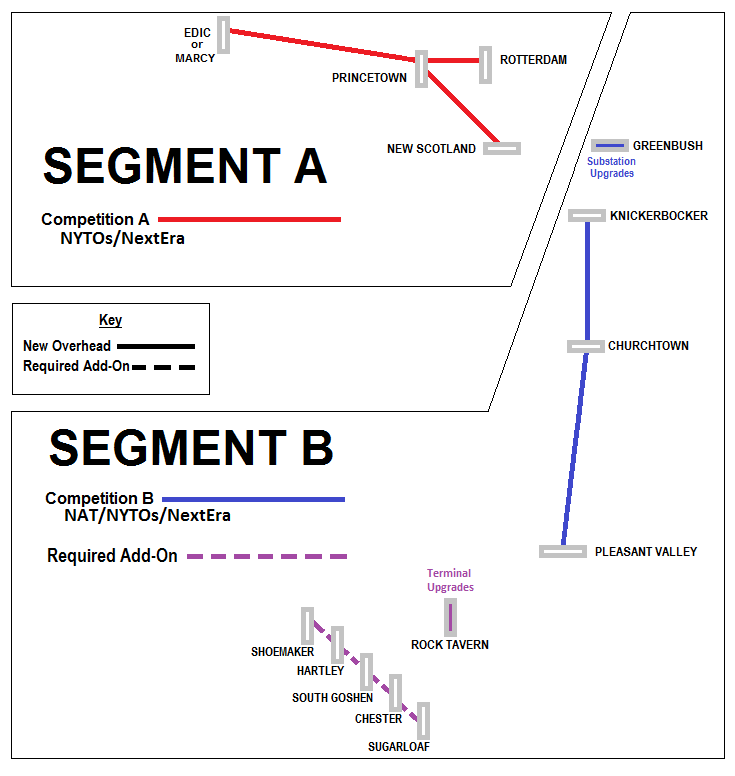 The comparative evaluation study is a complex undertaking requiring significant computer modeling of powerflows, electric generation production cost benefits, and electric generation capacity cost benefits and is to result in a benefit cost analysis for each project. In addition, each project is to be analyzed as to its specific environmental impacts. The study is also to include an analysis of alternatives to a transmission facility and to address the issue of whether there is sufficient public need for a transmission solution as a matter of public policy. On July 6, 2015, a DPS Staff Interim Report was submitted that addresses primarily the issues of environmental compatibility and beneficial electric system impacts on the Central East and Upstate New York/Southeast New York (UPNY/SENY) electrical interfaces. The report proposes narrowing the focus of the AC Transmission proceedings by recommending the elimination from further consideration of projects that have significant environmental compatibility issues in relation to the other projects, or that do not show sufficient electric system benefits as compared to the other proposals. 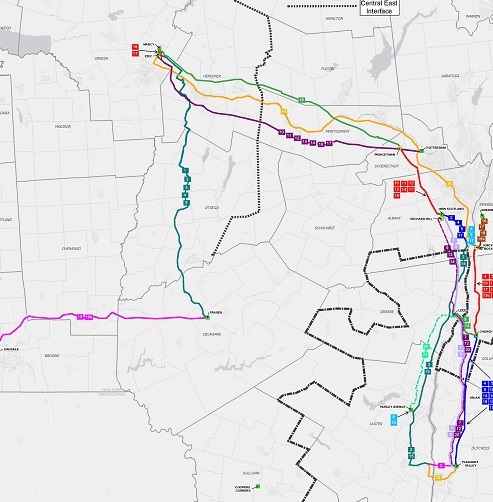 The report was presented as an interim report because of the need to do the further studies due to a recently announced change that may occur in the New York bulk electric system (the addition of a new 720 MW powerplant in Orange County). On September 22, 2015, a DPS Staff submitted its Final Report and Motion that completes a comparative evaluation of 22 transmission proposals and several non-transmission alternatives. In the report, Staff concludes that the Commission should proceed to significantly enhance New York State's bulk electric system by endorsing a specific portfolio of electric transmission upgrade projects. The DPS Staff Final Report and Motion are available for public comment. The parties to the proceeding will participate in a Technical Conference to be held on October 8th and 9th. Initial comments on the DPS Staff Final Report and Motion are due November 6, 2015. Reply comments are due November 23, 2015. The Commission will receive and review the comments before taking any action.